Donington Park provides two popular configurations, differing in their inclusion of a section that looks a bit like the "mouth of a whale," comprised of two short straights and the Melbourne Hairpin. The track and surrounding geography are nondescript, but the circuit provides a challenging layout with several areas that can create indecision in rider and drivers. Turn 1 has a late apex that should be clipped by most four-wheeled vehicles. Motorcycles will have better luck wrapping around the turn more closely. Turn 2 is a sweeping right-hander with three apexes - the first at the end of the straight section following Turn 1, the second mid-corner, and the third immediately before the straight section precceding Turn 3. The choice becomes how close to stay to these apexes, and whether or not to hit them. 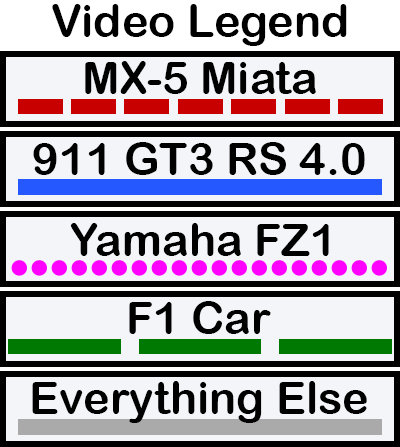 The F1 car and Miata touch all three apexes, whereas the Motorcycle and GT3 RS stay wide of the first apex. Only the Motorcycle exits Turn 3 farther right than mid-track, and only the Motorcycle stays well off the curbing before entering Turn 4. The Motorcycle line continues to avoid the edges of the track until exiting Turn 5. It may look like a mistake to miss the apex at Turn 5, but for the Motorcycle this is necessary to provide the correct setup into Turn 6. Entry into Turn 7 is where the four vehicles differ most in their approach. Slower vehicles and high-downforce vehicles will stay enter from the far left, whereas most others will let the exit from Turn 6 carry them past mid-track and transition smoothly into the entry to Turn 7. Coppice is another area where the Miata and the F1 cars takea similar line, exiting very wide after taking the first apex. The Motorcycle and GT3 RS stay in tighter, with the Motorcycle clipping the last apex, and the Porsche missing it by one or two vehicle widths. Turn 9 is a fairly standard S section that leads down toward Melbourne Hairpin, which is a squared off corner. Goddard is the final turn on the circuit that exits into Wheatcroft Straight. The most important thing to know about these turns is that it provides no benefit to stay wide while entering them, a mistake even professional racers often make. All vehicles should come close to both apexes at Melbourne, and stay inside all the way around Goddard. While racing, feel free to take advantage of the inside openings as a passing opportunity. There are a few really good chase laps starting at 4'22. Very nice driving. Staying a bit tighter around Coppice might help, but it might not. The line is a little loose around Turn 2, but it looks pretty good up through Turn 7. Turn 8 might be better taken tighter and hitting the final apex. Not sure if he missed the braking point for Turn 11, but there's no reason to take such a wide entry - stay tight around the whole corner. Lee is charging hard, and the approach looks pretty good, although he might have taken the correct line at Melbourne Hairpin simply because he was passing another bike. As with the last video, the wide entry at Goddard is counterproductive.